Gojapuri is spoken in the village Khalu (Geo-coordinates of Khalu village is 33 degrees 2’47’’N degrees 40’39E) which is around 40km from the main city of Doda. District Doda is located about 231kms from Srinagar, the village lies in the middle of the outer Himalayan ranges and the district is mostly a hilly area. Khalu village lies in Tehsil Badarwah. In the village Khalu there is a small area known as Baraila which is identified as the native place of the speakers of Gojapuri language. The community has Urdu and Kashmiri as lingua-franca for communication with the people other than their village fellows. The languages like Punjabi, Bhadarwahi, Dogri or Hindi also form the linguistic repertoire of the community. The community has its own native language known as Gojapuri which is grouped among endangered languages. 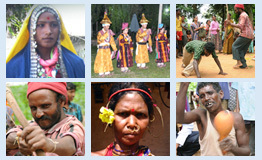 Gojapuri, an Indo-Aryan language is spoken by Approx 400 people in Baraila. Gojapuri speakers highly respect their mother tongue and freely use this language in their day to day affairs. The language has no Script and has not been documented till date. The language is transmitted orally across generations. The people of this community are very poor they depend directly upon agriculture which forms their primary source of income. The main crops grown are pulses, corn, some vegetables and Apple. Cattle breeding are also one of the sources that support the income for the community. The Khalu village is inhabited by two major religious groups – Hindus and Muslims. The people living in Baraila area are Muslims. Eids are the main festivals for their society which they celebrate with great festivity and enthusiasm.The houses are known as dhoke/kotha and are made of mud, stones, wood, and straw. The roof is thatched and is also made of mud. Their houses are not very well built. These houses are rectangular or square in shape. Each house is at a distant apart from each other. The houses of the community are built with material obtained from the forest and local resources. Cereals, wheat and maize comprise the part of the staple food for the people. The people are habitual of both vegetarians and non-vegetarians recipe. The favourite dishes of the people are maki ki roti/sarson ka saag. The project is aimed to document the grammar and ethno linguistic profile of Gojapuri language. The grammatical sketch and major portion of ethno linguistic profile of Gojapuri is almost completed. At the moment the development of electronic dictionary of Gojapuri has been taken up.